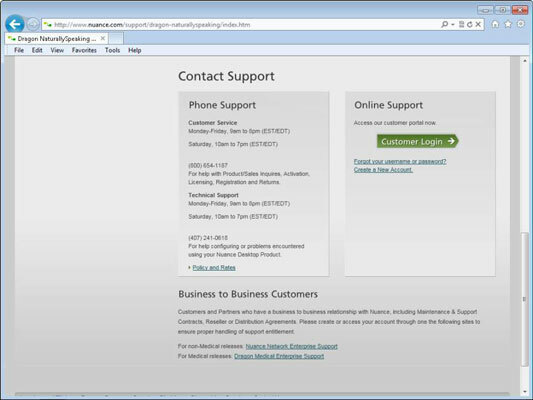 To access the support portal for NaturallySpeaking, you need to set up a free account. From this account, you can register your products, access your stored serial numbers, send a message to the Technical Support department, learn about new Dragon products, or order upgrades. In general, the better you define your question, the more likely you are to get satisfaction from your e-mail message. If you can say, “When I do this and this and that, I get this error message,” the technical support staffers have a better chance to figure out what’s wrong and give you a written answer. They also can do a good job with “How do I make NaturallySpeaking do X?” questions, though I believe I answer almost all of those in this book. And questions like, “Where can I find more about improving my accuracy?” can be easily handled in writing. For the first 90 days after you register your Naturally Speaking software, you will get your questions answered free. After the 90-day warranty expires, there is a fee. In Version 12, you will also see a Technical Support link in the Help menu. Click the Support link on the Nuance.com home page. Choose the Get Support link under the picture of Dragon NaturallySpeaking. You are taken to a screen that has a Customer Login box. Click the Customer Login button. Click the Create a New Account button. At the prompts, fill in your information. A screen appears that says you have created your account successfully and that you should check your e-mail to validate the account. Go to your e-mail and click the link. You are congratulated for setting up your account and there is a button for you to use if you haven’t already registered Dragon NaturallySpeaking. Repeat Steps 2 and 3. Then log in to your account where prompted. You are taken to the my Stuff area, where you see a list of the questions you asked and information about the products you registered. Click the Ask A Question link, and then click the Ask A Question link at the next screen. Fill in your question where prompted. You must have a valid serial number if you are asking about your specific situation. Click Continue until you have answered all the questions. You will arrive at a page that gives you a reference number for your question. Return to the my Stuff area and click the Notifications button to see the answer to your question. You will also receive an e-mail (at the e-mail address you put on your account) with the answer to your question. If you need to continue the conversation, there is a link to the my Stuff area for you to post a reply.